After the volatility spike in the first quarter, returns from U.S. stocks steadied in the second quarter and saw positive performance. 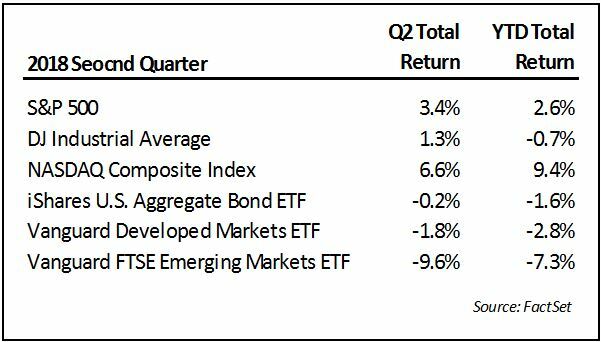 In contrast, returns from stock markets outside the U.S. experienced pressure with the broad indices for both developed and emerging markets finishing lower in the quarter. The declines were in part due to uncertainty stemming from the trade rhetoric and the continued ratchet higher in U.S. interest rates. The Fed instituted its second interest rate increase this year (seventh for the current cycle) in June, pushing the fed funds rate to a targeted range of 1.75%-2.0%. Consensus expectations currently look for one or two more similar-sized moves through the balance of this year. Although the tempered volatility and positive returns for U.S. indices in the second quarter suggest a degree of tranquility, we note the underlying data was again characterized by the “haves” and “have-nots”. 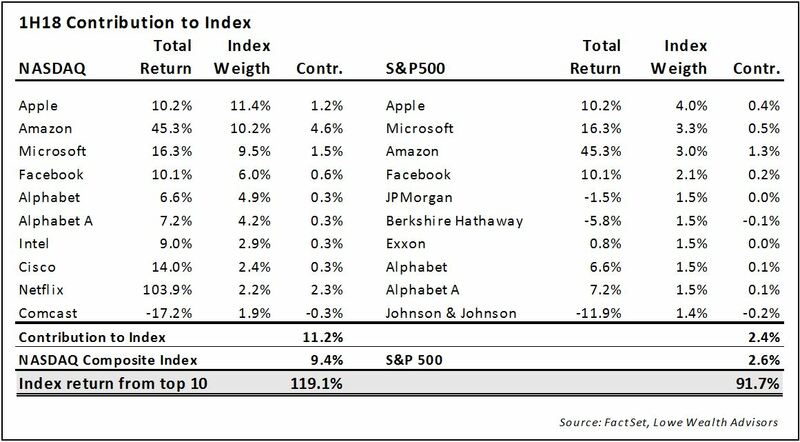 Tech stocks, and particularly the largest constituents, have essentially driven the performance in the S&P500 and in the NASDAQ thus far this year and offset losses elsewhere. The largest tech stocks all had big gains again this quarter as buyers rationalized growth potential and market dominance over potential regulatory (Facebook, Google, Amazon), valuation (Amazon, Netflix) or market saturation (Apple) threats. At the other end of the spectrum, industrial and financial stocks were among the laggards in the quarter. General Electric (GE), one of the most iconic industrial companies, has seen its stock decline more than 20% this year and had its shares removed from the Dow Jones Industrial Average following a run of 111 years. The headwinds for these sectors was at least in part to the expanding trade war rhetoric. Actions and threats centered on trade gathered steam in the second quarter. While China is the primary focus, several other trading partners were dragged into the mess to varying degrees. The initiatives have been impulsive, the implementation may be inconsistent and the actions frequently generate a reaction making the magnitude of risk hard to define. At this point, the aggregate value of goods subject to tariff action are small relative the overall economy – $34 billion in targeted items each by China and the U.S., however, the risk clearly centers on a possible expansion to additional goods and other trading partners. So far, the financial markets have generally taken a glass-half-full attitude, expecting the players to ultimately be more sensitive to the financial market stability and growth than forcing a damaging escalation. Ironically, it may be this complacency that emboldened the more recent threat to expand Chinese tariffs another $200 billion in goods. In light of the stock market’s advance since the election, we believe Trump is sensitive to perceptions and in our view, ultimately will consider the risk of financial market fallout in further trade war escalation. As a “dealmaker” this wouldn’t rule out further verbal jabs and token actions, but we think it will prevent implementation of something on a much more significant scale. This situation remains very fluid, though we believe the value of goods targeted would have to substantially higher (maybe $500 billion to $1 trillion?) before trade issues alone become a tipping point for the market. Significant expansion in trade aggression would, in our view, result in reduced economic growth expectations and increase the rate of inflation for consumers. While the tariff threats present a new range of uncertainties, the economy in the U.S. has remained solid. Unemployment is at low levels not seen since the tech boom of the 90s and companies are seeing healthy earnings gains, with the corresponding growth rate being kicked up even higher by the recent tax plan. 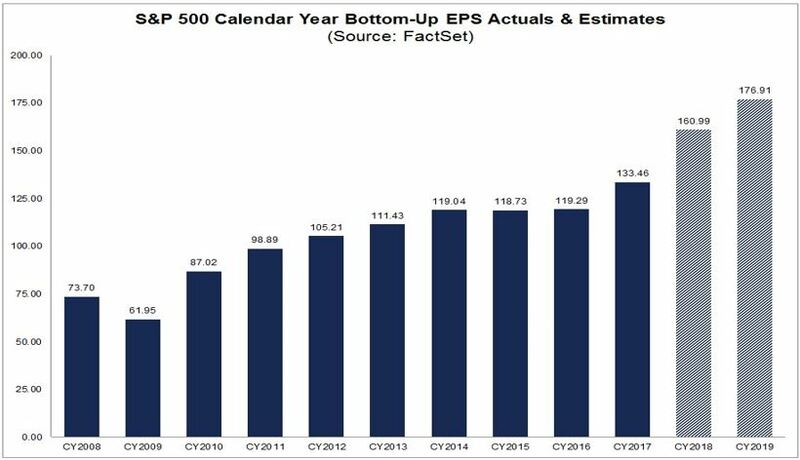 That policy change front-loads the benefits for companies which have in turn resulted in a jump in earnings estimates. Overall, companies have used those additional funds for an acceleration in dividend increases, stock buybacks, and mergers or acquisitions. The increase in corporate earnings has attenuated the lofty price-earnings multiple of the market a bit, but it remains to be seen how enduring the higher growth rates will be after the initial benefits are digested. These gains have furthered this economic expansion and during the quarter officially made this cycle the second longest since 1854 based on data from the National Bureau of Economic Research (NBER). In our opinion, the solid economic backdrop and boost in earnings estimates are key factors that have helped supports stocks in the face of other macro risks. We would look even more favorably upon these indicators if there was also more corresponding strength in traditionally economically sensitive sectors like financials, industrials and transports – three sectors that have exhibited lagging performance thus far this year. Aside from trade and the economy, we believe a significant factor to watch remains the evolution of global monetary policy, especially as the environment shifts from one of stimulus to contraction. The Federal Reserve is well into a program of lifting rates and reducing its balance sheet (prior stimulus) and the discussion points for the European Central Bank (ECB) meetings have become centered on the timing of future rate hikes and stimulus reduction. In our view, it is hard not to look for some drag on economic growth and market valuations as a product of reversing stimulus programs that have been a backdrop to multi-year financial markets gains. 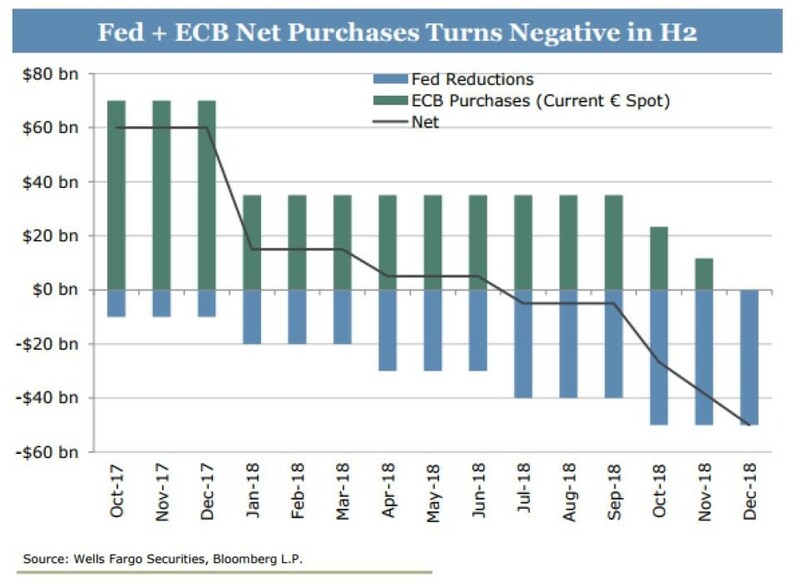 The following graph is reprised from our January letter and shows July as the being the first month where net funds from the Fed and ECB shift to contraction. This shift is not a dramatic reversal of inflows, but an ebbing tide that could present a larger headwind over time. For the most part, financial markets have been both higher and lower than where they started the year. In our opinion, the back-and-forth represents the tailwinds from domestic economic trends while there are headwinds from geopolitical uncertainties and the maturing of the business cycle. Predicting outcomes for the geopolitical issues is virtually impossible, but anticipating outcomes for the economic and business cycle less so. Timing and consequences are less certain, but the cycle of raising rates and reducing stimulus appear set to continue and this, in turn, may have historically similar implications for economic growth. One benefit from the rise in interest rates has been the ability to earn something other than next to nothing on cash balances and short-term debt. 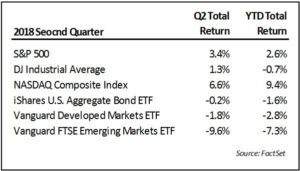 Our fixed income allocations have generally kept maturities short which has resulted in less principal decline than the overall bond market and these holdings rollover at a faster pace allowing for reinvestment at better rates. This risk avoidance strategy gave up some relative yield in prior years but has resulted in more stable values and now more attractive returns as interest rates have risen. Because this expansionary cycle is quite extended and monetary policy is now contracting, we expect to continue to employ a conservative, risk avoidance approach to most capital allocation decisions. Trade and other geopolitical issues are only adding to the list of fast-changing variables impacting markets. As these developments unfold we will continue to communicate any changes in our view and corresponding implications for client allocations. Please remember that past performance may not be indicative of future results. Different types of investments involve varying degrees of risk, and there can be no assurance that the future performance of any specific investment, investment strategy, or product (including the investments and/or investment strategies recommended or undertaken by Lowe Wealth Advisors, LLC), or any non-investment related content, made reference to directly or indirectly in this newsletter will be profitable, equal any corresponding indicated historical performance level(s), be suitable for your portfolio or individual situation or prove successful. Due to various factors, including changing market conditions and/or applicable laws, the content may no longer be reflective of current opinions or positions. Moreover, you should not assume that any discussion or information contained in this newsletter serves as the receipt of, or as a substitute for, personalized investment advice from Lowe Wealth Advisors, LLC. To the extent that a reader has any questions regarding the applicability of any specific issue discussed above to his/her individual situation, he/she is encouraged to consult with the professional advisor of his/her choosing. Lowe Wealth Advisors, LLC is neither a law firm nor a certified public accounting firm and no portion of the newsletter content should be construed as legal or accounting advice. A copy of the Lowe Wealth Advisors, LLC’s current written disclosure statement discussing our advisory services and fees is available upon request. If you are a Lowe Wealth Advisors, LLC client, please remember to contact Lowe Wealth Advisors, LLC, in writing, if there are any changes in your personal/financial situation or investment objectives for the purpose of reviewing/evaluating/revising our previous recommendations and/or services.